Developing clean and efficient fuel technologies is a lot like purchasing the vehicles - involving research, environmental consciousness and an added cost. But a growing number of manufacturers and consumers are willing to make the extra initial payments for technologies that have paybacks for the economy as well as for vehicle owners. With the tightening of air pollution regulations and the foreseeable, though not immediate end to oil reserves, hybrid vehicles and emission-reducing technologies are beginning to find their way into more owners' driveways. Many alternative vehicle designs have already been tested and disregarded for mass production based on various shortcomings. Battery-powered cars, for one, have a limited range of around 100 miles and operate on stored energy. Solar-powered cars, restricted by weather and with only a slightly longer driving range, were similarly found impractical. The hybrid electric vehicle (HEV) serves as a popular compromise between the needs for efficient driving and refueling, and reduced dependency on fossil fuels. A current favorite for environmentally and mileage-conscious consumers, the hybrid uses the standard internal combustion engine with an electric motor. It emits less air pollutants than conventional vehicles and has doubled fuel efficiency. "The hybrid power enables you to greatly improve fuel economy," said Art Garner for Honda. "It's self-charging, and that's the key." It was once thought that electric vehicles would be the immediate vehicle energy solution. But hybrids are more practical for long trips, because electric vehicles are limited by battery supply. Still, many hybrids are best adapted to in-city driving. The Toyota Prius actually receives better gas mileage in city streets, before the internal combustion engine kicks in. The Prius has been sold successfully in Japan since 1998 and in the United States for one year. The only other hybrid car currently on the U.S. market is the Honda Insight, a two-seater introduced in the United States in late 1999. Both range around a $20,000 base price. 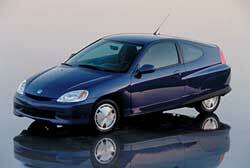 The Insight was the first HEV available for public purchase, and Honda plans to come out with a Civic hybrid in spring of 2002. But lest the larger vehicles be left out of the hybrid development, manufacturers are developing technologies for the ever popular but low-mileage sport utility vehicles (SUVs) and minivans. Toyota is introducing the Estima hybrid minivan to be released in Japan this year. In America, 2003 seems to be the year of choice for the larger vehicles, when Ford Escape and Dodge Durango hybrid SUVs, as well as a General Motors (GM) hybrid pickup truck, are all expected. With the existing available technology, hybrids appear to be the most practical current means of reducing vehicle emissions. And the buyers vary greatly in age. "There are somewhat older buyers in their 40s and 50s who are looking for high mileage and may also be environmentally inclined. And then there are young buyers looking for a fun-to-drive car," Garner said. Although hybrid technologies will not ever be completely emission free, U.S. Department of Energy's (DOE's) Office of Transportation Technologies predicts that the first hybrids on the market will significantly reduce smog-forming and global warming pollutant emissions. Signs point to the fuel cell vehicle as the next alternative to the internal combustion engine and the hybrid. Most major car companies are currently working on fuel-cell technology, which combines hydrogen (derived from petroleum, natural gas, methanol or renewable sources) and oxygen, without combustion, to generate electricity. Fuel cells can double or triple the mileage of standard internal combustion engines, while emitting only water vapor as a byproduct. So far, hydrogen storage has been a major concern in developing fuel-cell technologies. Honda's research and development center in Torrance, Calif. recently announced the operation of its hydrogen production and fueling station, which extracts hydrogen from water through solar power and also uses back-up electrical power. But other installations may be farther away. A large volume of hydrogen is required in fuel cells, since hydrogen is normally a gas. And some experts worry that hydrogen could easily leak through even strong container walls. But one leader in hydrogen fuel technology, GM, intends to work with Quantum Technologies Inc. to address such hydrogen storage concerns. Another common concern of fuel-cell vehicles is the possibility of explosions. Hydrogen is a clean fuel and may ignite more easily than gasoline, but the chances of igniting hydrogen are still slim, and the flames are generally not as hot as those ignited by gasoline. The fuel of a modern hydrogen-powered vehicle "would be stored in one or more fiber wrapped composite tanks that could survive 50-mph head-on collisions, engulfment by a diesel fuel fire and pressure at least 2.25 times design pressure without rupture," according to Breakthrough Technologies Institute/Fuel Cells 2000. Still, fuel cell research is in the first stages. "We believe fuel cells have the best opportunity to be the power plants of the future. But that's probably 20 years away or so," Garner said. "So in the meantime, hybrids really present an excellent opportunity to maximize fuel economy." The perhaps less conspicuous refineries have increasingly been using technologies to reduce emissions and save money spent on gasoline and diesel fuels. In August 2000, U.S. Environmental Protection Agency (EPA) finalized new regulations to reduce emissions from heavy-duty trucks and buses. According to these new standards, all diesel vehicles over 8,500 pounds will reduce nitrogen oxide (NOx) emissions by more than 40 percent through reductions in hydrocarbons, beginning in 2004. In an act that could help diesel technology achieve their regulations, EPA has also proposed new standards for diesel fuel quality, effective in 2006. These standards would put a ceiling on diesel fuel sulfur content and maintain hydrocarbon emissions. EPA estimates a three to four cents per gallon increase in the price of diesel fuel as a result of the new standards, though other estimates have been higher. The political atmosphere of America is paving the way to alternative fuels and vehicles as manufacturers are encouraged to develop more efficient and environmentally designed vehicles. Lately, domestic oil production has been decreasing, while the vehicle population and miles driven continue to increase. Oil consumption in the United States for transportation alone exceeds domestic production, and most proven global oil reserves are in areas controlled by Organization of Petroleum Exporting Countries (OPEC). Oil and gas imports play a part in the U.S. federal trade deficit as well; in fact, petroleum imports for transportation are responsible for half of the deficit. And health costs of urban ozone concentrations are estimated at $.5 billion to $4 billion per year. The United States continues to grow more dependent on international trading for oil, while the cost to do so is increasing in a number of ways. In part to compensate for this trend, the Energy Policy Act was passed in 1992 to improve energy efficiency and reduce the United States' dependence on foreign oil. It also requires estimations of greenhouse gases, which are "gases that absorb heat re-radiated from the surface of the Earth," according to U.S. Geological Survey (USGS). Still more changes are going on in the White House, as President George W. Bush recently announced his new energy plan. Under the plan, the president intends to spend $4 billion on tax credits, to encourage the purchasing of energy-efficient vehicles between 2002 and 2007. The auto industry should look on this news with satisfaction, as some groups have been pushing for tax credits to increase demand for hybrids. Despite waiting lists for the Insight and Prius, which speak to the current appeal of the cars, Honda and Toyota still contend with high development costs and little profit. But many hybrid vehicle developments that appear in the next few years may be in part due to actions taken by the last presidential administration. The Partnership for a New Generation of Vehicles (PNGV) was created in 1993, by the U.S. Council for Automotive Research (USCAR) to help develop a car that will travel up to 80 miles per gallon, while meeting reduced nitrogen oxides, carbon dioxide and hydrocarbon levels. It bears many similarities to DOE's hybrid electric vehicle (HEV) Program created the same year, and the goals of the two programs are fusing. Under PNGV, the Big Three Automakers (DaimlerChrysler, Ford and General Motors) work together with federal agencies, government defense and energy and weapons laboratories. PNGV has developed a number of technologies so far, including the Ford P2000 low storage requirement (LSR) hybrid electric vehicle, which can achieve over 60 miles per gallon. The proposed "supercar" to be developed will be designed to meet EPA's Tier 2 emission limits at levels of .125 hydrocarbon, 1.7 carbon monoxide at 100,000 miles and recyclability of at least 80 percent, up from the current 75 percent industry average. But groups such as the Sierra Club and Friends of the Earth are criticizing PNGV for its budget of one billion dollars over the past eight years and seeming reliance on diesel as a fuel. Green Scissors, a watchdog for environmentally wasteful spending, claims that automakers are using PNGV to avoid raising Corporate Average Fuel Economy (CAFE) standards to curtail global warming. The group recommends that funding for the partnership be withheld until participants accept higher emissions standards. While President Bush has proposed tax credits for fuel-efficient vehicles, his attention to global warming is somewhat lacking. A 2001 report by the National Academy of Sciences, commissioned by the White House, concluded that Earth's temperature is rising, and emissions from burning fossil fuels has released approximately twice the amount of carbon dioxide required for the observed increase in temperature. The president remained skeptical of the science and requested the report. But many Americans feel differently, according to a recent survey. A Time-CNN poll appearing in the April 9, 2001 issue of Time magazine found that three-fourths of Americans consider global warming a serious problem. Future trends in transportation fuel and the correlating increases in greenhouse gases (GHGs) are causing some scientists and statisticians to worry. Vehicles and vehicle miles traveled are expected to increase twice as fast as the population growth in the United States and faster in Africa and Asia. Over the last decade, climate discussion has focused largely on anthropogenic GHGs or those generated by human activity such as fuel combustion. Carbon dioxide may be the most discussed GHG, but water vapor is the principal absorber of incoming solar radiation and the most abundant GHG. Water vapor and carbon dioxide are the two major emissions of hydrocarbon fuel combustion. Other major GHGs are methane, nitrous oxide, fluorocarbons and ozone. Rising gas prices and increased federal regulations, while not always pleasant for vehicle owners or those in the auto industry, are creating a condition receptive to hybrid and alternative fuel technologies. Manufacturers have been in the developing process for years and are continuing to improve designs for greater efficiency and cleaner emissions. As for now, the results of manufacturers' labors are just beginning to be seen, as hybrid vehicles and emission-reducing technologies make their way from the imaginations of designers and manufacturers to practical commercial and consumer use. U.S. Department of Energy -- www.energy.gov. U.S. EPA Office of Transportation and Air Quality - www.epa.gov/OMS/. Research Triangle Institute - www.rti.org. EPA regulators are getting help with emission reductions from the technology sector. DOE's Pacific Northwest National Laboratory (PNNL) is contributing through science to diesel fuel emission reduction. Researchers there have combined an electrically charged gas with a catalyst to cut out half of the harmful oxides of nitrogen from diesel engines. PNNL lab results show the reduction of soot, the part of exhaust containing carbon and organic substances, as well. Research Triangle Institute (RTI) of North Carolina, which has been providing emission-reducing technologies for 15 years, is currently focusing on gasoline. One of their more recent undertakings, removing sulfur from gasoline, is helping refiners meet EPA's low sulfur gasoline Tier 2 requirements. "We just want to use the existing infrastructure and use our processes," said Dr. Raghubir Gupta, manager of process research at RTI. The company removes sulfur compounds in naptha (petroleum and liquid products of natural gas) by using solid regenerable sorbents discovered at RTI. And future projects for RTI are not far off. "We might extend this technology to remove the sulfur from the diesel," Gupta said. This article originally appeared in the September 2001 issue of Environmental Protection, Vol. 12, No. 9, p. 26.